Washington Sound and Approaches Washington Territory. 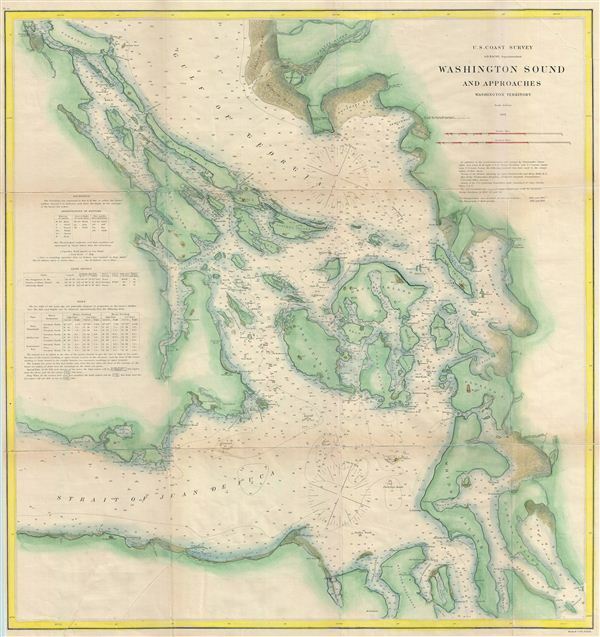 A fine example of the U.S. Coast Survey's 1866 nautical chart or maritime map of Washington Sound, Washington. The map covers the Strait of Juan de Fuca, the Gulf of Georgia, Channel de Haro, Rosario Strait, Admiralty Inlet, the northern entrance to Puget Sound, as well as parts of Vancouver Island, British Columbia, and Washington State. This is the U.S. Coast Survey's first comprehensive presentation of this region. The chart includes countless depth soundings as well as detail notes on soundings, tides, and light houses. Issued under A. D. Bache for the 1866 edition of the U. S. Coast Survey Superintendent's Report. Good. Some wear and discoloration on original fold lines. Backed with archival tissue.